Brock Chadwick, a 7-year-old Maine boy, made a simple wish by asking people to mail him Halloween cards. He has gotten responses from around the globe. People from around the world are helping a 7-year-old Maine boy battling brain cancer celebrate his favorite holiday. Brock Chadwick of Biddeford has a simple wish: he is asking people to mail him Halloween cards. "It's been 8 long months of continuous chemotherapy, extensive radiation and major surgeries," his family posted on Facebook about the request. "Little things like this can really uplift him." The response has been overwhelming. Since the start of the month, Chadwick has received hundreds of packages and thousands of cards from people across the country and around the world. 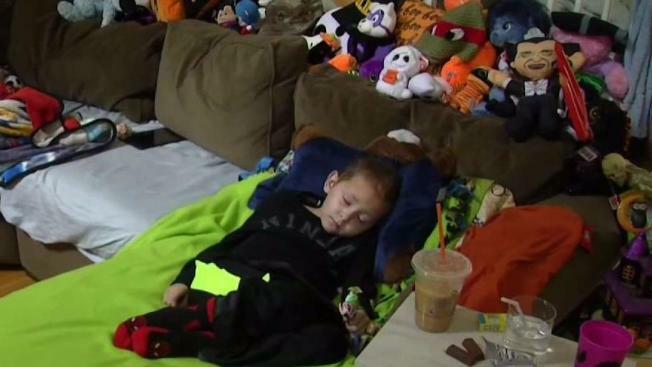 "Tons of packages, toys, candy and cards -– he is loving every second of it," said Brittney Horton, the boy's mother. Chadwick has an aggressive form of brain cancer that has spread to his spine. And even though he is exhausted from chemotherapy, his family says the kindness of strangers is helping him get into the holiday spirit. "It motivates him, for sure," said Horton. "He's been seeming a lot better than he was a few weeks ago," said William Chadwick, Brock's father. They have nicknamed the month "Brocktober," and it has been a month full of surprises. Last Saturday, a group of community members and the Biddeford Fire Department helped decorate Chadwick's front yard with donated Halloween decorations. On Sunday, about 300 motorcyclists from across New England organized a ride for him. They dressed up in Halloween costumes and surprised him outside his Biddeford home. "[The response] has been way bigger that I could have imagined," said Horton. She said Brock has received so many toys and donations that they plan on donating items to children's hospitals to spread the love to other children. Chadwick said his favorite part of "Brocktober" has been receiving his favorite candy: Hershey Bars and Hershey kisses. He wants to dress up as either Captain America or the Incredible Hulk, but some say he doesn't need a costume to be a superhero.